I’m from Los Angeles, and lately, I’ve been wanting to move back. I’d be closer to my family — and Grantland headquarters. Also, I’d get my pickup basketball game back. They call it “noonball” at USC, my alma mater. I’ve played ever since my sophomore year, about a decade ago. Pete Carroll played with us for years before leaving to coach the Seattle Seahawks. But we were all equals on the court. It was almost like a fraternity. A regular pickup game is therapeutic and calming. I’ve lived in New York — the mecca of hoops — for more than three years, and haven’t found anything remotely close to what I had at USC. I played at Columbia for a while before they realized that I didn’t actually go there, and that was the end of that. Most gyms cost more than they should and don’t even include basketball courts. Frequent travel makes it an unwise investment. And the East Coast weather means outdoor games aren’t always an option. I hadn’t played for about six months before All-Star Weekend rolled around, and I missed it. But when writers convene for events like the All-Star break and NBA Finals, there are usually games to be found. They are, as you can imagine, usually not highlight-worthy. Some writers (ESPN’s Chris Broussard and Sports Illustrated‘s Chris Ballard, for example) can genuinely play. Among the options in Orlando this year was a pickup game hosted by the Jordan Brand. I went to that one. And I’m glad I did. When I arrived, I learned Jadakiss, DJ Clue, and Wale would probably play. I pictured two scenarios: Either they would not show up to play with and against some writers, or they would arrive with too many people to get a decent run in. They all arrived, to my surprise, and the numbers stayed manageable. Jadakiss was on my team, which included DJ Clue for the second run. I’m a fan of Jadakiss. I just wish he would drop more albums because he’s almost at a Detox-like pace. I wasn’t as rusty as I’d feared, but I found out quickly that Jadakiss is a volume shooter, which took me and NBA.com’s John Schuhmann — someone whom I had played with before — out of our games. We played ones and twos up to 15. Jadakiss pulled up and shot 25-footers on most of the possessions and the rest of the team tried to score off the many putbacks. 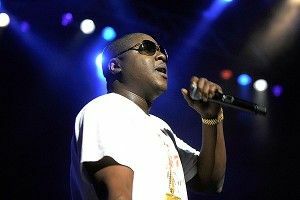 I was hoping Jadakiss would do his trademark laugh or say “Welcome to D-Block” after he scored. But the closest he came to that is when we reeled off four or five fast break points in a row. “This ain’t Chelsea,” he screamed at DJ Clue over and over again. DJ Clue played well and had his team in position to win with a 14-13 lead. We scored once and got a stop. Jadakiss drove to the basket and dished it off to me and I scored the game-winner on a reverse layup. That ignited a minutes-long argument between Jadakiss and DJ Clue over whether that was the actual game-winner or someone had miscounted. Jadakiss hit the game-winner in the next game — a long 2-pointer against NBA.com’s Sekou Smith as we again trailed 14-13. Then he Tebowed. Yes, he Tebowed. It made my day. I called it quits after about five games.